Despite the fact that it’s now fall, it’s still hot as heck in south Florida. Despite the fact that it’s still hot as heck in south Florida, I still want to enjoy comforting fall inspired recipes. So I went to work in my Kitchen and made this Harvest Wild Rice Salad with Pumpkin Vinaigrette. 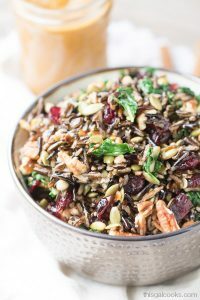 This harvest wild rice salad is filled with toasted pecans, dried cranberries, pepitas and baby kale. I made a simple pumpkin vinaigrette for this salad. Throw seven ingredients that you probably already have on hand into your food processor. Process until well blended. Boom. You have pumpkin vinaigrette. I used Pompeian Balsamic Vinegar and Pompeian Extra Virgin Olive Oil in the pumpkin vinaigrette. Pompeian offers great products at affordable prices. That’s why they are my go to brand for olive oils and vinegars. Find out where to purchase your favorite Pompeian products by visiting Pompeian online. So…back to this salad. Did I mention that it’s P-E-R-F-E-C-T for fall? Cause it is. You can enjoy this salad as a main dish or as a side. I enjoyed mine with a piece of grilled salmon. I also enjoyed a bowl of it solo for lunch. If you’re a fan of cheese, try it with a little feta. It taste’s great with a little feta. Preheat your oven to 350. Line a baking pan with aluminum foil. Place the chopped pecans into the pan and lightly spray with cooking spray. Toss to coat. Bake for 3 minutes and then stir. Bake for 3 more minutes. During the last 3 minutes of baking, watch the pecans to make sure they do not start to burn. If they start to brown a lot, remove them from the oven. Once done baking, remove from he oven and set aside to cool. Heat 1 tsp of olive oil in a skillet over medium heat. Add the baby kale to the skillet and saute for 1-2 minutes. Remove from the skillet and set aside to cool. 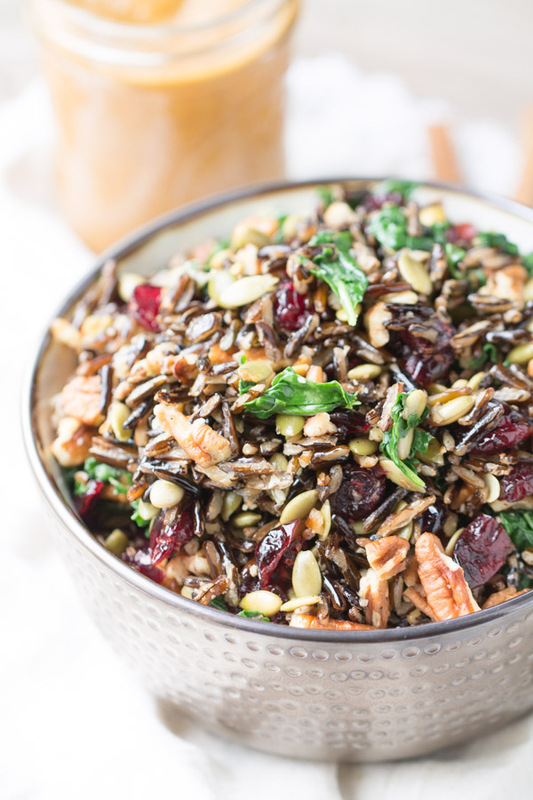 In a mixing bowl, toss together the wild rice, dried cranberries, pepitas, pecans and baby kale. Set aside. Make the dressing. Add the pumpkin puree, applesauce, olive oil, maple syrup, salt, pumpkin pie spice, water and balsamic vinegar to a food processor. Process until well blended. Serve the salad in bowls. For a full serving, use ½ tbsp to 1 tbsp of the dressing. For a half serving, use about a teaspoon of the dressing. The nutrition information provided is for 1 Cup of the salad with 1 tbsp of the dressing. Halve the nutrition information for the ½ C serving. The dressing is very robust and only a little is needed. I suggest starting with a small amount and then increasing as needed. The amount of dressing used (over or under 1tbsp) will alter the nutritional information. Store unused vinaigrette in a refrigerator for up to 1 week. I’m a member of the Pompeian #PantryInsiders. This recipe was written on behalf of Pompeian, however, all opinions and recipes are my own. Wow – that vinaigrette sounds incredible! Pinned! I love wild rice, too, and I hardly ever cook with it. This looks AMAZING. It’d be perfect for Thanksgiving. I love wild rice too and really should eat it more often! Love love this pumpkin vinaigrette!! Amazing salad. Look delicious! Love the idea of a pumpkin vinaigrette! What the what?! That pumpkin vinaigrette has me feeling wayyyy too hungry right now! Pumpkin vinaigrette >> you are getting very hungry. very hungry. very hungry. Anything pumpkin usually has a way of making me hungry! The salad looks fantastic Julie! 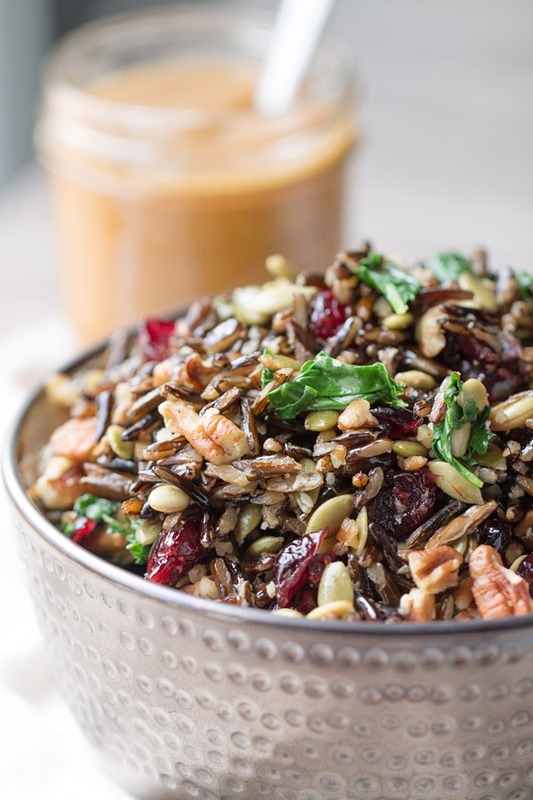 Love wild rice and the pumpkin vinaigrette sounds amazing! What a beautiful fall salad, Julie! The pumpkin vinaigrette sounds amazing. I have everything I need for this salad and definitely need to try it soon for lunch! Thank you, Ashley! This salad is perfect for lunch! This looks incredibly good, Julie. Right up my alley! Pinned! So I have one question for you and that’s -when are you gonna bottle this Pumpkin Vinaigrette up and sell it to the masses? 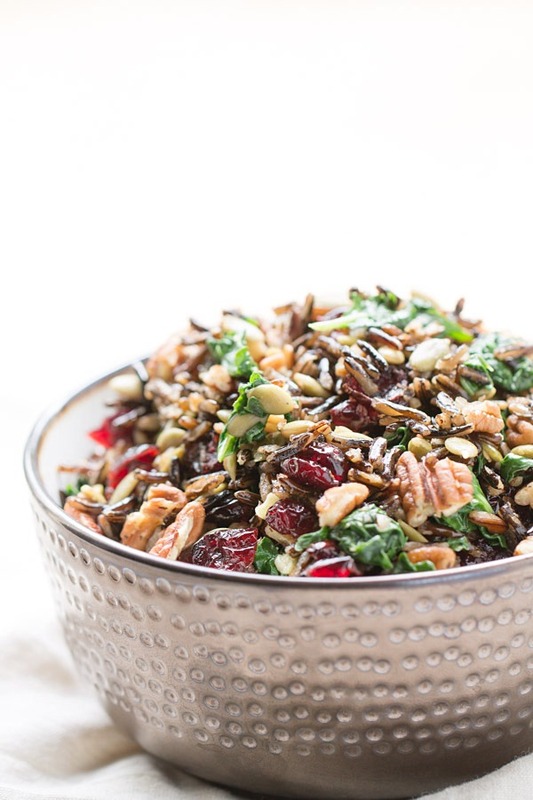 It sounds phenomenal – mixed with the pepitas and wild rice and pecans and kale simply fabulous! This looks delicious, Julie! :) I could totally see this as a healthy side dish on the Thanksgiving dinner table. Pinned. YES! This would be perfect served for Thanksgiving dinner! This salad looks amazing, so colorful and delicious! I can practically hear it crunching while I wish I was eating it. :) Hot as heck in SoCal too, and nice to find a pumpkin recipe that doesn’t require me to fire up the oven! Thank you, Meggan! I’m yearning to be somewhere that’s a little cooler than Florida. I’m so jealous of all of the cooler weather and changing leaves that many people are enjoying right now! Love this! Just saw on FG! Pinned! That Pumpkin Vinaigrette! The Maple, the balsamic, the pumpkin…want! What a wholesome salad, looks very pretty and delicious! Will be trying it soon. Thank you for sharing the recipe! Wow Julie, that salad looks amazing!! This looks fantastic! If I made all of this the night before would it keep well for my lunch the following day? Yes, it would keep. The dressing is good for up to a week and the salad should be good for 3-4 days. I made this on Saturday and am still enjoying it today! Sorry, I see that information now. I made this last night and it’s heavenly. There’s no way it would last a week, and I’m surprised it could last an afternoon, (Because no one in my house could stop eating it, lol.) Thanks for the recipe. I love rice so much and I’m loving this salad. Kale? Check. Rice? Yum. That dressing. Julie…this rocks! Julie this salad really looks great. I love the idea of pumpkin dressing too, perfect for fall. Mmm – this looks SUPER yummy! Love the wild rice and the autumn twist. Making! What can I replace the kale with? Can’t eat kale, but salad sounds good. You could use fresh spinach or bok choy in place of the kale. I’m trying to imagine complimentary side dishes with this gorgeous salad and would like to get opinions on its sweetness level. I know, its a subjective question, but would you say its savory enough to not compete with the sweetness of candied yams, for instance? To me, this salad isn’t very sweet. I think it would be fine served along with candied yams. I hope you enjoy the recipe. Happy Thanksgiving! Pingback: Spotlight On: the Nutribullet | Feisty Cooks! I make my own vinaigrette’s – always have – to me, it finishes a salad. But I never have used pumpkin in a vinaigrette! Brilliant!